Sometimes when I’m explaining the concept behind this blog, I say, “You know to some people, it’s as if I took a pink, fluffy, cute, cuddly, innocent, teddy bear, and just started stabbing it repeatedly with a machete.” Trust me, I am well aware that there are some people out in this world that can’t rally behind my message because they themselves have embraced the breast cancer awareness movement as it’s been for the last two or so decades, and I just come off like an angry prick. And I recognize that, some people won’t ever agree with my critiques, so we can agree to disagree. But with that in mind, today I want to highlight one ongoing breast cancer awareness fundraising campaign I heard about recently. I want to highlight it because in every way, the company leading the campaign is doing nothing short of what they believe is their best effort to help their local community. However, the way that the campaign is marketed to the general public led me to asking some honest questions that I think we ALL should be asking ourselves, regardless of whether or not you agree with my overall views presented in this blog. 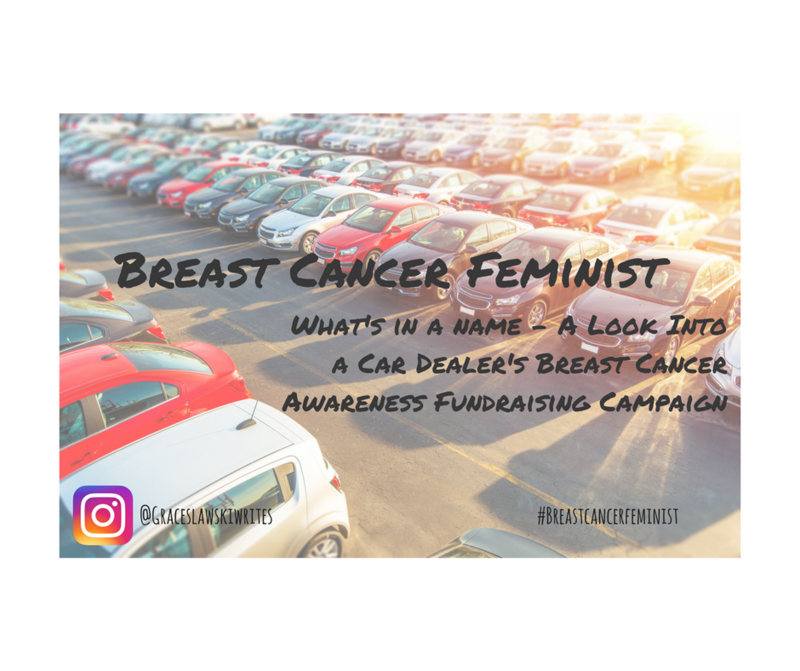 Granted, this campaign is not anything special, if anything it’s typical of a run-of-the-mill breast cancer awareness fundraiser. And yet, its normalcy is so critically important because you could see a campaign virtually just like this one in your own backyard. Alright so before going further let me reiterate – in no way am I accusing Route 18 for being disingenuous or hurtful in any way to their community. However, they are misleading their community, and here are two reasons why. Let’s look at the name of the campaign for a second “Reach for the Cure.” Now let’s pause on that. How do you find a cure for breast cancer? If you answered research, you’re correct. But wait a minute, the proceeds for this campaign are going towards awareness and education. How does awareness and education equate to finding a cure for cancer? They don’t. Are awareness and education bad for the community? No, I’m not a monster. But awareness and education will not be the solution for a cure to breast cancer, so why did they name the fundraising campaign based on a pretty little lie? Then there was another detail I can’t get past. I understand pretty clearly that the money from the fundraiser is going towards breast cancer awareness and education. But I saw this flyer that was used to promote the 2017 fundraising campaign. In the top left hand corner in italics, you’ll see the sentence, “Joining together to support awareness and treatment!”(bolded by author for emphasis). 2017 promotional flyer for the Route 18 “Reach for the Cure” breast cancer awareness fundraising campaign. Photo not my own. Hold up, awareness and treatment? Since when did treatment become involved in this equation? Treatment is not a synonym for education or awareness, so what is doing floating around in the banner ad? This past Monday, I went ahead and emailed the Route 18 Community Relations Officer Robert “Bob” McCusker to ask him that very question. As of yet he has not responded. Should he respond I will publish a follow-up to today’s post, but for right now all I’m left to do is ponder, why is treatment all of a sudden being mentioned in their ad? To mention treatment on the ad when it’s not listed on any of their other controlled media is straight-up confusing. And for what it’s worth, to bring this back slightly full circle, treatment still won’t result in a cure for breast cancer either. We don’t hold companies or non-profits involved in breast cancer awareness fundraising accountable for this misleading information they use in their marketing outreach campaigns. This isn’t ok. If they want to help the community then they need to be upfront, be honest, and tell us the truth. “It feels good when you know you’re making a contribution and you’re making a difference in someone’s life, and it’s a good feeling, isn’t it?” 1450 WCTC radio show host Burt Baron asked Bob McCusker on-air last October. Well, it would be nice if the community knew how exactly the Route 18 auto dealership is making a difference in someone’s life. I don’t think that’s too much to ask. Previous The NFL Is Changing How It Markets Cancer Awareness, But Is Change Always a Good Thing? Next So Where Do Men Fit Into Breast Cancer Awareness, Really? I just listened to the radio interview from last year, and I heard something else that was absolutely unbelievable. The radio host was talking so proudly of his bra decoration (I HATE THOSE DISGUSTING EVENTS!!!). He actually said that this was for the event at St. Peter’s for their Breast RECONSTRUCTION AWARENESS DAY. Reconstruction Awareness? Really? Now, this is a guy who has no awareness of what he should even be aware of, or it tells me what his awareness is really of. I literally had to rewind it to make sure I was hearing it correctly.